← Second hand attitude: dressed by Savers & Freecycle. A big ‘to-do’ about nothing. I have always been a big advocate of the ‘to-do’ list. I even kept a book of all my school holiday ‘to-do’ lists for many years. Anything not completed would carry over to the next school holidays. Usually these would be projects that required a bit more time; sewing or letter writing or sometimes even just reading all the free newspapers I was receiving through school. During stressful times I would write ‘to-do’ lists to keep focus or stop myself from forgetting important things. Sometimes it helped me order things in my brain, or give priority to those tasks that needed it while not forgetting those that were important but not time bound. 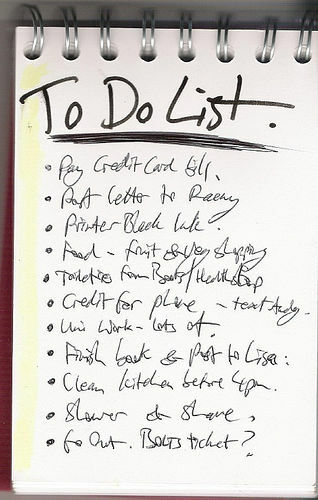 I have been known often to ‘cheat’ on my ‘to-do’ lists and add things I’ve just completed in order to cross them off. There is that real sense of accomplishment when finishing something on a ‘to-do’ list. in fact, according to this guy there is actually a dopamine release when crossing an item off the list. This is, of course, juxtaposed with the crippling sense of defeat we feel when we fail to cross anything off the list that day at all. When I was briefly unemployed in my early 20s I wrote weekly lists to give myself the sense of accomplishment I’d always felt when working or studying. I felt this gave me focus and stopped me from the inevitable unemployment blues. I would still highly recommend this as a strategy for bringing focus when your life feels completely unfocused. More recently I have noticed a flaw in the ‘to-do’ list scheme. I was writing a school holiday ‘to-do’ list, which I usually found to be a really fun task to start the holidays. I had begun to notice, however, that by the end of the holidays I was feeling annoyed at myself. I hadn’t crossed off enough things. There were dozens of things I should have and could have completed that I didn’t. The ‘to-do’ list always contained fun things as well as practical things and necessary things, but it didn’t ever include things like “stay in your PJs all day” or “read your book in the sunshine” or “hang out with BP and Little Fearse in the backyard”. The ‘to-do’ list didn’t fit with our new slow and simple life. For this reason I have abandoned the holiday ‘to-do’ list. I’ll still make a ‘to-do’ list if I have a particularly busy week, or have a lot of appointments and things that need doing. I still make ridiculously long and absurd ‘to-do’ lists for BP who seems to like the challenge. I still think they have a purpose, but no longer will I schedule tasks into my leisure time. There’s nothing simple about that. Do you ‘to-do’? What do you love or despise about lists?